World’s Biggest Airplane Takes First Flight « Adafruit Industries – Makers, hackers, artists, designers and engineers! The world’s largest airplane took flight for the first time ever on Saturday morning. Built by rocket launch company Stratolaunch, the 500,000-pound plane with a 385-foot wingspan lifted off shortly after 10AM ET from Mojave Air and Space Port in Mojave, California. It was a critical first test flight for the aircraft, designed to launch rockets into orbit from the air. The inaugural flight lasted for 150 minutes, according to the company, after which the plane safely landed. The dual-fuselage Stratolaunch is designed to fly to an altitude of 35,000 feet, where it can drop rockets that ignite their engines and boost themselves into orbit around the planet. There is no rocket on this particular flight. 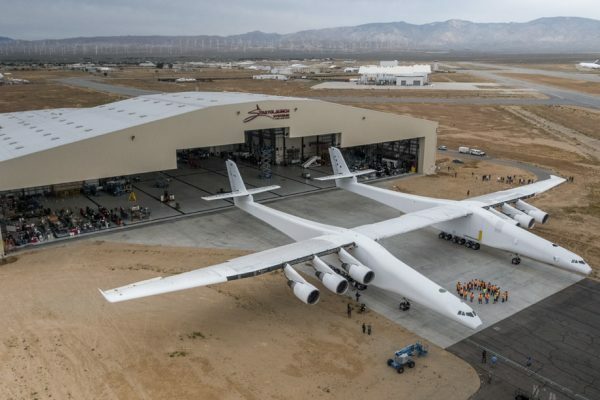 But the company has already signed at least one customer, Northrop Grumman, which plans to use Stratolaunch to send its Pegasus XL rocket into space.